Many people are not aware that there are differences between sunscreens. Here are a few tips and facts to help you understand the differences between sun protections. Chemical Sunscreen contains compounds that absorb UV light and convert it into a lower energy wavelength. Active ingredients are Octinoxate, Octisalate, Oxybenzone, Benzophenone, and Menthyl Anthranitate. Some concerns with these ingredients are that they can produce free radicals, systemic absorption and estrogen effects that can further damage or irritate the skin and our healthy cells. If used too frequently, this can be counterproductive to trying to protect your skin and keep it healthy. New FDA recommendations emphasize using sunscreen labeled as broad spectrum (meaning it protects against both UVA and UVB rays) with SPF values of 15 or higher. To maximize the sunscreen’s protection, apply it 30 minutes before exposure and reapply at least every two hours. Physical Sunscreen physically protects the surface of the skin by reflecting and scattering UV light off or away from the surface. Active ingredients are Titanium Dioxide, Iron Oxide, and Zinc Oxide. No claims are found against these ingredients other than historically these compounds could leave a whitish cast to the skin. New formulations, however, are now less visible on the skin. Zinc Oxide and Titanium protect against both UVB and UVA rays, providing the broadest range of UV protection. As with any sun protection product, sunscreens will break down after several hours of exposure to sunlight, therefore re-application is imperative to fully protect your skin. Below in SPF Explained are guidelines for re-application. Sun Protection Factor (SPF) is a rating system for sunscreens. 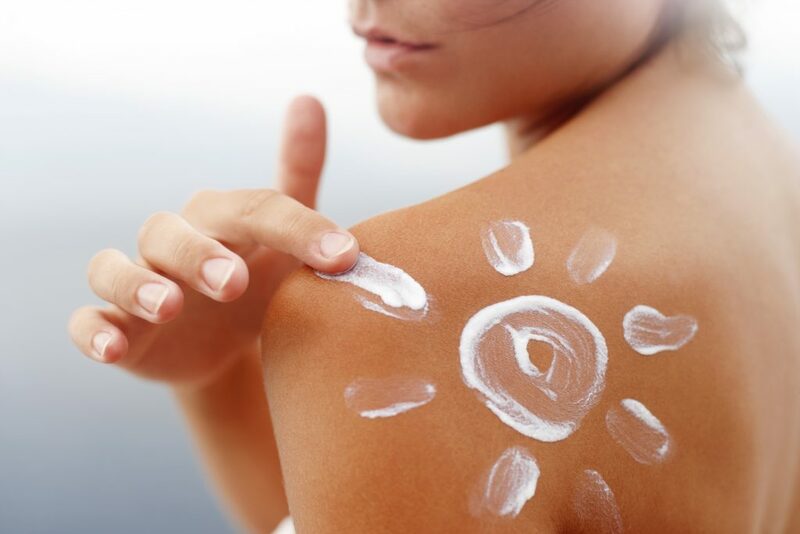 It is often a misconception that SPF relates to the amount of time your sunscreen will protect your skin, for example: that an SPF 15 will protect for 15 hours. This is not true. The SPF does not relate to the amount of time skin can be exposed to the sun without being sunburn but relates to the degree of protection. A higher SPF will block more UVB rays and better protect your skin (see the chart below). All sunscreens should be re-applied every few hours, no matter the SPF. In addition, makeup with SPF provides minimal protection so a sunscreen should still be applied prior to makeup application. It is also important to wait a few minutes for the sunscreen to set before applying your makeup.